This page provides instructions for configuring a Binary Authorization policy using Google Cloud Platform Console. As an alternative, you can also perform these tasks using gcloud commands at the command line. This step is part of setting up Binary Authorization. Select the evaluation mode for the default rule that specifies the type of constraint that Binary Authorization enforces for the rule. If you selected Allow Only Images That Have Been Approved By the Following Attestors, click Add Attestors to add attestors to your project. You must create attestors before you can add them to your policy. See Creating Attestors for more information on this step. Enter the fully-qualified attestor name in the Attestor Name field. The name has the format projects/PROJECT_ID/attestors/ATTESTOR_NAME. If you want the use the policy in dryrun mode, select Audit Log But Do Not Block. 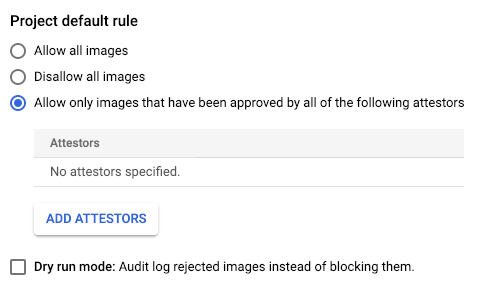 Dryrun mode is an enforcement mode in a policy that allows non-conformant images to be deployed, but writes details about the deployment to the audit log. Dryrun mode allows you to test a policy in your production environment before it goes into effect. A cluster may also have one or more cluster-specific rules. 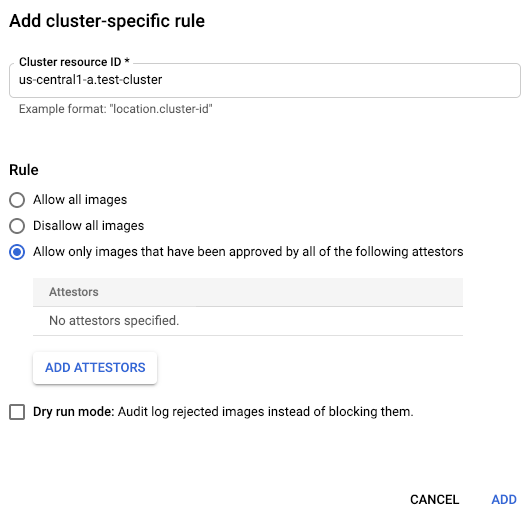 This type of rule applies to container images that are to be deployed to specific Google Kubernetes Engine (GKE) clusters only. 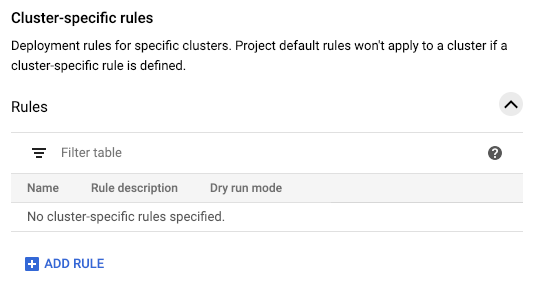 Cluster rules are an optional part of a policy. Return to the Policy tab in the Binary Authorization page in the Google Cloud Platform Console. Enter a name for the rule in the Cluster Name field. If you want the use the policy in dryrun mode, select Dry Run Mode. Binary Authorization allows you to exempt images in two ways: using an exempt images whitelist and/or global policy evaluation mode. You can combine both means in the same policy. Global policy evaluation mode is a policy setting that causes Binary Authorization to evaluate a global policy before evaluating the policy that you configure as a user. The global policy is provided by Google and exempts a list of Google-provided system images from further policy evaluation. 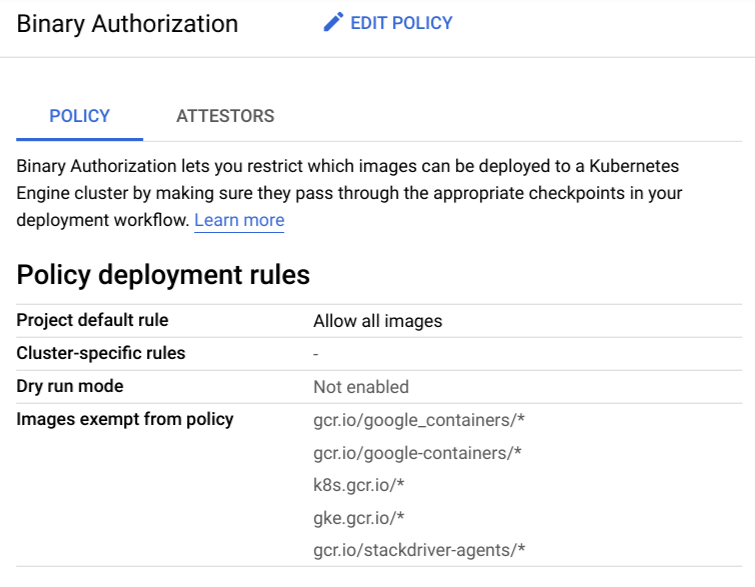 When you have this setting enabled, images that are required by Google Kubernetes Engine are not blocked by policy enforcement. The global policy is evaluated prior to and in addition to user policy evaluation. To enable global policy evaluation mode, select Trust All Google-Provided System Images. Click View Details to view the registry paths that are exempted when you select this option. To manually specify additional exempt images, click the Images Exempt from Deployment Rules drop-down list. Then, click Add Image Path and enter the registry path to any additional image you want to exempt.